They really need to repair the bridge down to Esquimalt lagoon. It's really annoying to drive all the way up to Metchosin road just to backtrack down to the peninsula, but who knows where they are in construction of that. Looks like there's a pretty huge hole in the road unser the bridge, too. 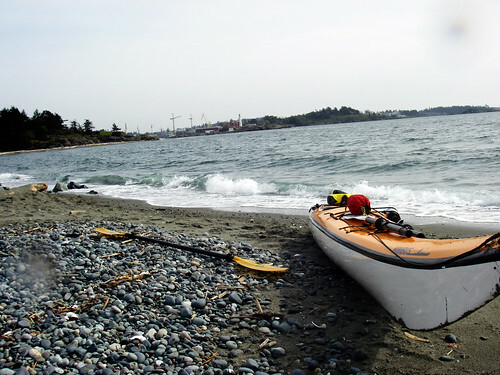 I've finally got back to Esquimalt Harbour after almost 2 years (it was actually one of my first paddling trips in my current kayak). 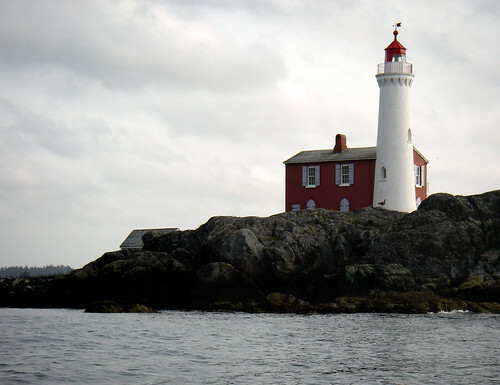 Today was forecast to be proteced from east winds out in Haro Strait and it was bright, but extremely hazy with fog. There's no access to the side beach by car right now, so I put in on the juan de fuca side of the peninsula to moderate swell. Wow.. something goofed with blogger and I lost the rest of this post forever.. sorry folks. Have a look at the photos - I can't be bothered to write it all again. yeesh - friggin computers I tell ya. Long story short - awesome day, cool ruins on Cole island and wind turned SSE later on and made for some challenging swell conditions. Popped my spray skirt too soon and the surf landing on the way back in filled my cockpit with water about 6 feet from the beach. As usual, I'm more interested in getting out on the water for 3 or 4 hours, and this kind of conditions would have had me off the water in about 45 minutes. I said goodbye to John and the gang and headed out to somewhere a little less insane to enjoy paddling instead of being wet. The former happened; the latter, not as much. I was intending to go to the calmest place, which was Brentwood Bay, but decided just to see if Dallas road was calm. Lucky for me, the wind was blowing ESE at 5-10knots with moderate swell. I put in at the usual Ogden Point spot right down next to the breakwater on the exposed side. 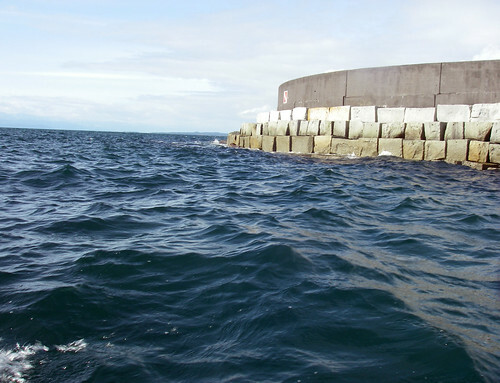 I watched a couple of divers heading in for a day under the sea and kind of laughed at how calm this side of the island was as I paddled around the breakwater into Victoria. The construction at the Ogden Point docks seems to be going will with one significant structure constructed and some new material being placed. The wind was coming much stronger suddenly and had slipped more South. but inside the breakwater, I was pretty protected. Paddling toward Victoria's downtown, I noticed a bunch of sailboats heading out to enjoy the winds out in the strait. 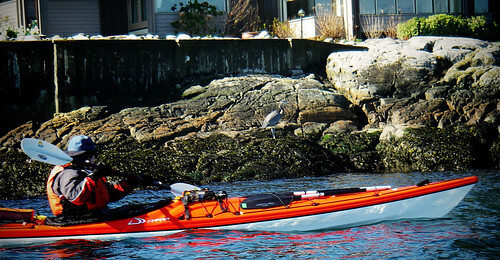 There were also kayaks, surfskis and fishing boats milling around. 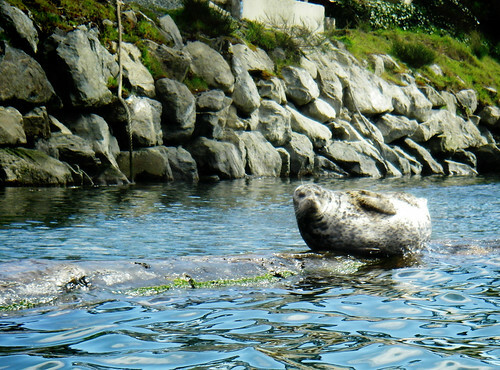 With a healthy tailwind, I headed up the Gorge spotting a number of seals lazing around on anything warm. I also got in everyone's way in a big canoe competition up at Go Rowing on Jutland. There was a surprisingly large crowd standing on shore. as the winners passed their finishing line and circled back to the dock. I got up to the Tillicum Narrows bridge and found almost no current. 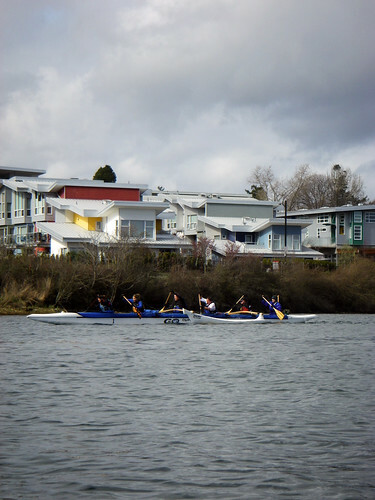 I passed through and paddled out to the VCKC clubhouse and turned around to head back home. It seemed the further up the Gorge I went, the calmer the winds and water. What signaled me to head back was the flags on the buildings had moved even more South. I took the opposite shore back through the Gorge and went back under the blue bridge into the Inner Harbour. The flags on the empress were now SSE and I was getting a bit worried about my chances of getting back around the breakwater in one piece if the voracity of the wind was anything like this morning. I waited patiently for a float plane to finish motoring into dock and crossed the harbour at Laurel Point. Coming around the coast guard breakwater, I began to see absolutely huge standing waves on the horizon. 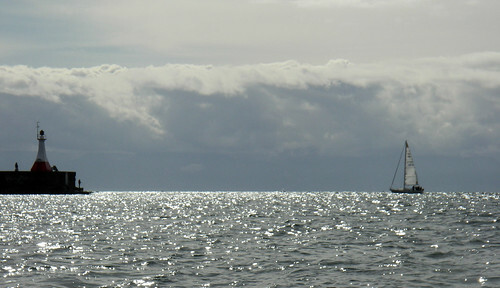 The sailboat in the photo above was completely visible on minute and a mast the next. I had real concerns of whether I should try this at all or just pull out at the angler's association, but I thought what the heck, I'll try it. I was not prepared for the troughs on the south side, they were shoulder high waves and I was giving poor people on the break water a heart attack. I kept looking over and saw people pointing out at me :/. Big reflecting waves from the breakwater were making for pretty challenging paddling - luckily I only had about 500m to paddle to shore, so I was just careful to keep the paddle ready to brace. I had one close call, but bracing hard helped push me right out of it and the rest was smooth sailing, though I was completely soaking wet from all the wave action across my bow and stern. I was happy to be off the water, but I had a fantastic paddle in the harbour. I packed up and just headed home for a shower to get all the salt chuck off me. Today I joined John and Louise at good old Cadboro Bay. Today was intensely sunny! I'm with everyone else and I'm going to call it summer-esque conditions in humble Victoria. The winds were supposed to be light, but ended up being 5-10knots from the Northeast - a consistent swell was coming into the bay and the current was due to be a little over a 2 knot ebb. 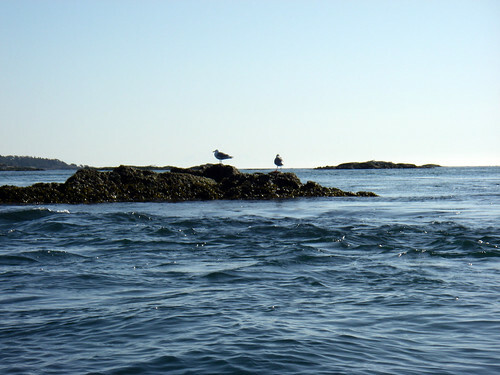 I was going to give a free ride on Baynes channel to Chain Islands a try, and without mysterious smoke on the horizon, I was resolved to do it this time. We put in on a sandy beach I haven't seen for a while at Cadboro Bay. The tide had already gone out some. Still getting used to the unloading dance on the new car and what goes where, but I got down to the water and we were off to Cadboro Point. We meandered through the rocks along the shore and saw lots and lots of birds on the way out. Just past Flower Island, we caught a glimpse of a glorious Mount Baker in the morning sunlight. The current was definitely on the ebb, but it really wasn't too crazy. 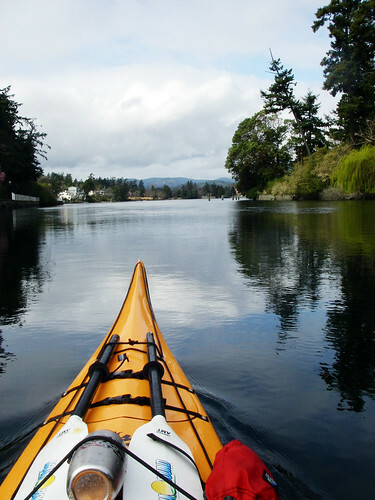 I started my run toward the Chains and John and Louise paddled back along the mouth of cadboro bay to meet me at Oak Bay Marina. There was some current, but nothing incredibly life changing. The water smoothed out on my way into Baynes Channel thanks to the land blocking the wind. The tailwind and current got me up to about 12km/h sustained on my way down and then dropped off as I approached Great Chain Island, the larger island in the Chains just off Oak Bay Marina. It's pretty fun taking a ride on the current when the chance arises, it's a lot less of a pain than crossing it or fighting it. 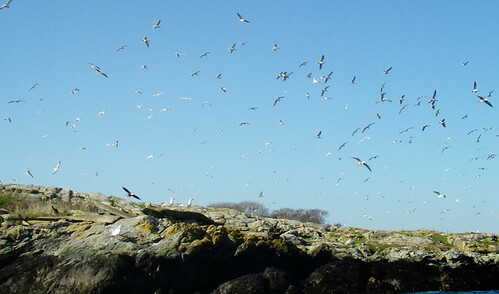 Chain Island was full of gulls, Canada geese and crows with a bunch of seals looking on. It was full until a bald eagle decided to stop by sending every last bird on the rock up into the air. The eagle was flying so low that I originally thought the reason the birds took off was me getting too close. Once the eagle passed the birds began to land, filling every square inch of the rock. With the current still dragging me around a bit, I pulled around the back part of the island where I got to see a whole bunch more harbour seals. There's also a lot of weird wreckage all over the island, but it's like 10 feet up. Must have been some big seas through here recently. I made it back to Oak Bay Marina after being pushed around in the crossing a little. There were lots of boats scrambling through the Turkey Head traffic path from the marina to take advantage of fair winds in the strait. 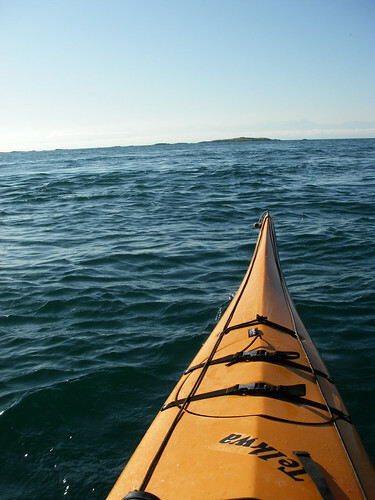 I paddled around Mary Tod island a little and all the birds from last week were somewhere else today. 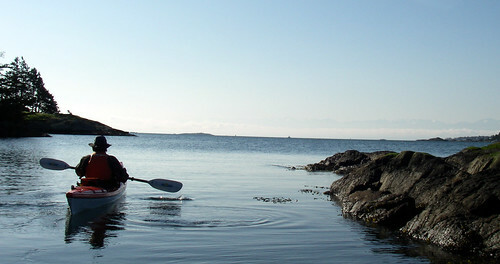 I met up with Louise and John on the other side of Mary Tod Island and we headed back alongside a group of 6 other paddlers out enjoying the beautiful weather. We went back along the south shore of Cadboro Bay and saw a numbe of Herons along the shoreline. We got bach to the beach via the Royal Victoria Yach Club Marina which is a very tight squeeze at low tide. When we got back to the beach, it was much longer than we left. We all celebrated today's outing at the coffee house afterward. It looks like the CRD and other conservancy partners have officially purchased many of the hot zones in Western Forest Products' lot sale for a cool 18 million. 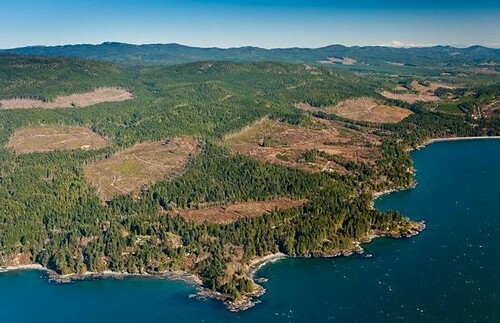 About 20% of the land up for grabs sold today in trust including many of the foremost properties in the portfolio such as Jordan River, Sooke Potholes and parcels around the Victoria watershed. By all accounts, this seems like a fairly good first step though I have this small niggle about the haste of the sale and the "secret deal" verbiage. I hope Juan de Fuca gets what it pays for and that their constituents were consulted before making a purchase that was a small bit out of their direct means. Altogether though, I.. I think.. just maybe.. the democratic process and activism actually worked here. I'm keeping my ear to the track for more developments in the next few days, especially with the elusive UBC agreement still sailing the horizon. 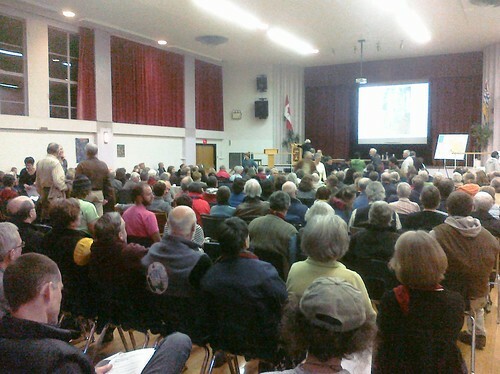 A packed SJ Willis auditorium that had the same morbid tone of the Mega Yacht Marina hearings last year met tonight to discuss the hilarious and staggering ramifications of what the BC Liberals have completely mismanaged. I'm naming the political party, because the fault of this really rests completely on so many of their agents' shoulders - if you don't believe me, there's a much better written review of this stinky public policy disaster by John Doyle, BC's own Auditor General located here and here. 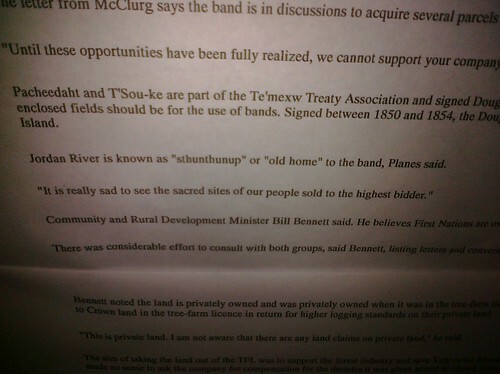 What happened in this situation gives us no legal recourse, a very delicate finance and resource management situation between all of the stakeholders and a possible fallout that could put treaty negotiations with the First Nations people in the Sooke and Jordan River back many years. Oh and we have just under 5 days to do anything about it. What the auditor saw coming in 2008 is now upon us, and please read that stuff it's incredibly written. Western Forest Products is in the process of selling underutilized land assets to recapture the capital it needs to stay profitable. Fair enough, business is rough right now, we're emerging from a pretty heavy recession and some ongoing softwood levies from the USA. On the outside, this isn't a big problem, all of that rural land is packaged for 300 acre lots with only single dwellings and guest houses per plot to encourage industry. 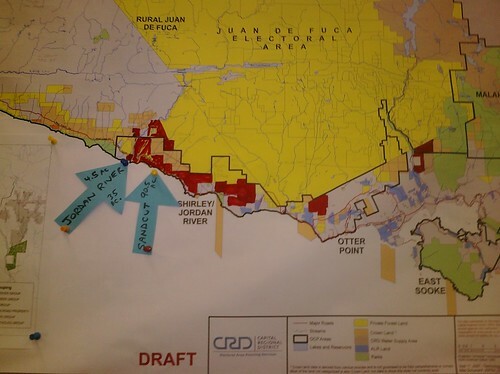 The panel tonight, however, showed that this is prime real estate land and looking at the community plans of incorporated Sooke and the plans of the CRD for the unincoporated areas of Jordan River and Shirley, the land may have been strategically selected to smooth rezoning opportunities. Undoubtedly the jewel of the South Island Portfolio, the Jordan River Group includes sixteen titles ranging in size from approximately 4 to 722 acres. Encompassing over 2,400 acres in total, the Jordan River Group is situated around the Jordan River town site, and provides an incredible opportunity for a wide variety of uses in a region where there has historically been an extremely limited supply of real estate ... The Jordan River Group is situated in the Juan de Fuca Electoral Area and is mostly within the Shirley/Jordan River OCP area. 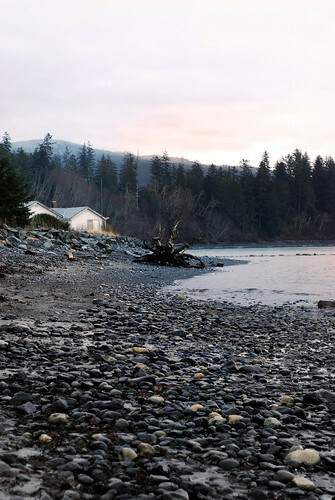 Rare Juan De Fuca beach front. Some of the points made tonight were pretty straightforward. The coastal communities are not ready to grow at any kind of speed, the tax burden and quality of life challenges stemming from the watersheds emergency services and governance is a major roadblock to development. The community also relies on the forest industry to help buoy up their other expenses, so there's a real incentive not to poke the bear. The First Nations are trying to tie up a fairly lengthy treaty negotiation in the region and really want a solid, long term environmental strategy and cleanup in their traditional territories. If that means they need to own land instead of trusting good-faith relationships with surrounding governments, they seem driven to do it. 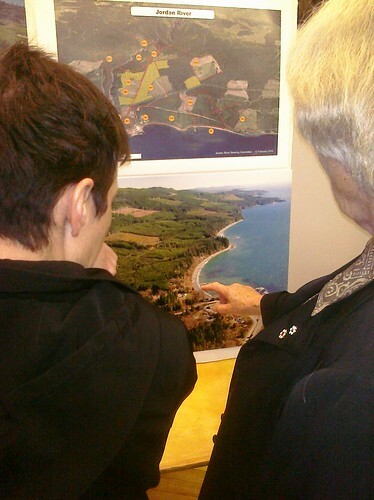 People from the Island and eco-tourists want a reason to visit the area and not just have a sprawl like what happened in the ukee-tofino corridor. With no compensation gained from the government and WFP interactions, the onus has been put on the public to solve this one and either buy out the land or get out of the way. One promising avenue may be a model forest plan, which the University of British Columbia proposes in conjunction with other strategic partners, including the CRD. This would give the land to a publicly steered organization, but the plan needs to be hydrated. Some of the other actions resembled the resolution sought for Clayoquot sound, which involved a transition to a UN biosphere or historical site, but with so much second growth forest, and WFP recently logging the areas, it may be a difficult sell. If the idea of excessive fallout isn't cool with you, I'd say at least do the democratic process and let everyone responsible for the blunder hear your voice and where your future vote is headed. Looks like I have another public meeting to look forward to in the near future. This is yet another serious environmental and incredibly large-scoped project has quietly slipped into the local news with some tragic timing - not even a week earlier and this would have fallen onto the press room floor for an Olympics story. A paltry sum of money has been printed on the wilderness surrounding Sooke and Jordan river following a land parcel sale by Western Forest Products, and, like the marina and other hustled-in land sales, not even one person in the organizations involved in the sale know what's happening. Now some figures in government are trying to slow the freight train down and see if this land can be put in trust. I have to agree with Anderson on his stance about "increasing irrationality" in public policy on the Island. I'm hoping that if we keep packing the rooms on stuff like this, someone might get a hint. The public meeting, organized by the Jordan River Steering Committee and Dogwood Initiative, will be held from 7 p.m. to 9 p.m. Wednesday [March 3, 2010] at SJ Willis auditorium, 923 Topaz Avenue. Speakers include Husband, Chief Gordon Planes of T’Sou-ke First Nation, Calvin Sandborn of University of Victoria Environmental Law Centre and Arnie Campbell of the Otter Point and Shirley Ratepayers Association.